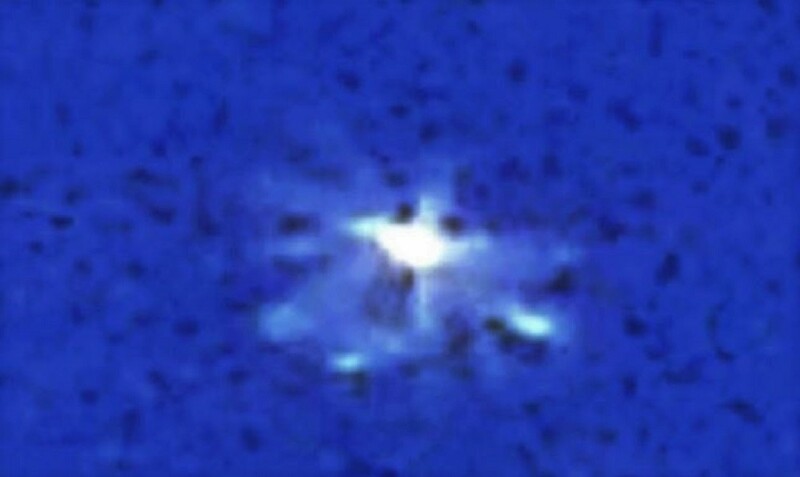 A husband and father, 35, claims he doesn’t necessarily believe in UFOs but cannot resist posting an alleged UFO sighting near Charlotte on Facebook. 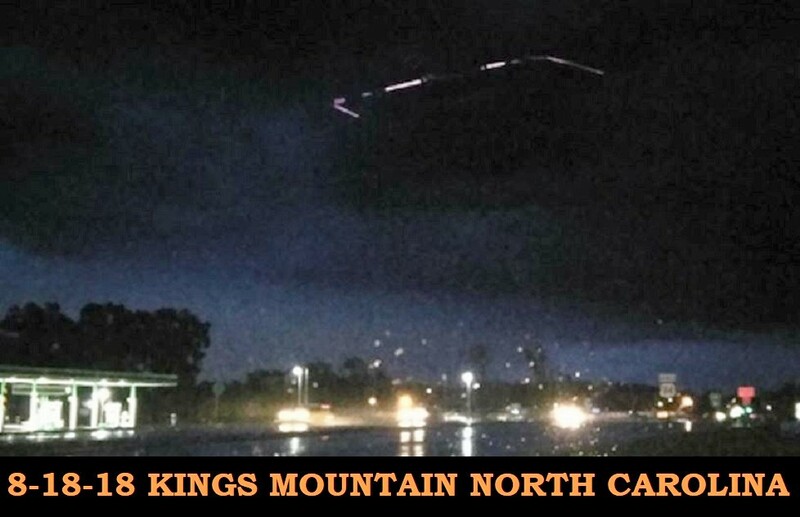 Javion Hill of Kings Mountain in North Carolina said he captured multiple photographs of the object during a storm on the night of August 18, as he drove on U.S. 74 southwest of the largest city in North Carolina. The images show something square having edges fringed in lights hovering above the treeline. Hill said the craft frightened him to the point that he could not sleep that night. Mr Hill was on his way home with his wife on the speakerphone and noticed there was a tornado coming, so he was trying to take a photo of the clouds for his wife. But then he saw something unusual that left him baffled. He started trying to take as many pictures as he could while driving. Mr Hill said that he pulled over at the next exit trying to get a video, but the aircraft had disappeared then a heavy rain followed instantly. He further stated that the actual object was bigger than what was seen in the picture. He was worried for his safety even after the sighting. He claimed to be an unbeliever in UFOs until that moment. While in the US Navy in the summer of 1986, I was standing lookout aboard the USS Edenton ATS 1 (currently decommissioned). The lookout watch, stood outside on top the bridge of the ship, and was responsible for reporting all contacts seen both in the water and sky. It was around eleven p.m. one clear night at sea, located about fifty miles off the coast of Cape Hatteras, NC. During one of my scans of the night sky, out of know where, four red circular lights appeared. The lights where hundreds of yards apart from each other and formed a square. At first, I thought it was four separate air craft, such as, military helicopters because the lights were stationary; however, due to the distance from the ship, the lights where too large to be aircraft running lights. There were also no other normal running lights like green and white, which make-up the normal outline of an aircraft seen at night. The lights where located about twenty degrees above the horizon and about a mile away from the ship. Again, these four red lights were each about the size of a small plane, which were very bright and visible in the night sky. The night sky was also clear, moon lit, and a moderate amount of stars were visible, which also aided in calculating the distance and size of these lights. As stated, when I first saw these lights they were all stationary in the sky and appeared out of know where. Once I noticed that these were not normal lights, grouped in a square and not moving, I called down to the bridge over a salt and pepper line informing the conning officer of a possible UFO sighting. This brought laughter across the wire at first, but I relayed the contact again in a stern but excited voice, which succeeded in getting the bridge officers attention. After relaying the contact information a second time, the four lights, in a flash, darted towards the horizon amazingly fast. The lower two lights in the square went first, with the top two lights following directly behind them in a curved swooshing motion and there was no sound. Then all four shot straight up into outer-space and out of sight, all within a split second. At this point, I felt very excited and shocked, and was personally praying someone on the bridge had seen what I just saw. Having been an avid watcher of the night sky, seen shooting stars and a believer in that life has to exist somewhere out there, I become even more excited because I knew, I just saw my first unidentified flying object(s). 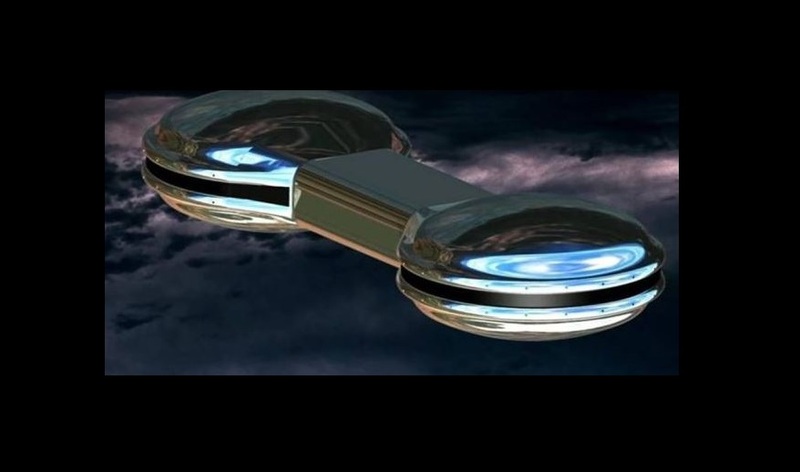 To my amazement, when I returned to the bridge after my watch, I was very pleased to learn that the conning officer and everyone else on the bridge had seen this sighting and logged it into the ship’s log as a UFO sighting. Next, after a half hour had passed since the sighting, the radiation detection system (gamma roentgen meter) on the bridge started making a loud clicking sound. At first, no one seemed to know what was making this sound then a very loud bell went off notifying us as to what was going on, we were being radiated. When the instrument stopped clicking, it indicated we had taken a hit of 385 roentgens in the period of about one minute. At this point, the captain of the ship was awoken and called to the bridge, as well as the chief in charge of the radiation metering equipment onboard ship. The captain was not impressed with an entry of a UFO sighting being placed in the ship’s log, and at first, took the roentgen meter as being defective. However, the chief informed the captain that the meter had been serviced and calibrated the day before and that other like meters throughout the ship had just gone off indicating the same amount of roentgens received as the bridge. The captain stated not to log the instance concerning the radiation exposure and left the bridge. During the rest of my watch duty that night, no officer or enlisted person spoke of what happened, and also acted liked nothing happened. This experience, however, was etched into my memory as if it happened yesterday and I have told this story to only a few people, people who I thought would believe me. This is also the first time I have documented the events of this night. In conclusion, as an indication of the strength of gamma radiation, I and others received that night; all the personnel during the Project Trinity experiments conducted in 1945 at ground zero, only received between 1 and 6 total roentgens of gamma radiation. This leads me to believe, we traveled through the wake of radiation produced by the UFOs seen thirty minutes earlier. – MUFON CMS NOTE: The above image is CGI. This is the first key flying saucer case of modern times. As you can see from my sections, ‘Ancient Alien Sightings’ and ‘Aliens in Ancient Art’, reports of flying objects are certainly not unique to our century. However, this is the case that caught the attention of the media and re-informed the contemporary world that flying saucers existed. Kenneth Arnold was a private pilot and a businessman. He was also a member of the Idaho Search and Rescue Mercy Flyers and a Federal Deputy Marshall. On June 24, 1947 Arnold joined in a search mission to find a Marine Curtis C-46 transport plane that was believed to have crashed in the Cascade Mountains. While flying at about 9,000 feet at 2:00 p.m., Arnold saw nine silver disks moving in formation directly across his flight path. He estimated them to be about twenty-five miles away. Since they were unusual, to say the least, Arnold decided to time them to estimate their speed. He checked his watch as they passed Mt. Ranier and again when they passed Mt. Adams. It took them 1 minute and 42 seconds. After landing and checking the distance between the two peaks, Arnold realized the disks had been traveling over 1,700 miles per hour! This was twice the speed of sound, and the world airspeed record in 1947 was only about 650 miles per hour! Not only Arnold, but people flying in a nearby Douglas DC-4 also saw the flying disks. In addition, disks were seen by hundreds of people on the ground. The disks made no sound. They were completely silent. In an interview with The East Oregonian newspaper, Arnold said: “They flew like a saucer would if you skipped it across the water.” When the Associated Press picked up the story, they called the disks “saucer-like objects.” From this, the term ‘Flying Saucer’ was officially made an integral part of the human language. Be sure to check out the CIA’s official report on the Kenneth Arnold sighting in our ‘Alien Documents’ section. NOTE: The above image is CGI. 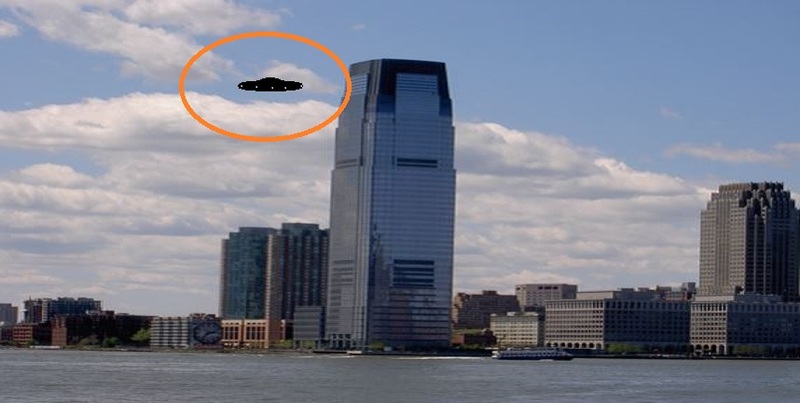 I was standing near a busy train station in Jersey City when I noticed what appeared to be a black saucer shaped disc flying slowly around the Goldman Sachs building on the Hudson River. At first, the two people I was with saw the object also. They beloved it was just a drone. I decided to walk a little closer to observe the object more and left my friends behind. The plaza I was standing in was packed with people. Its a Saturday afternoon and we are standing across the river from the World Trade Center. Lots of Helicopters and Commercial aircraft flying into nearby Newark Airport. A storm was also blowing in at the time with dark clouds and gusty winds. Anyway after some time, I watched the object slowly ascend up ito the clouds and disappear. Please note that this object was flying around a large area. I observed it fly over the Hudson and back over Jersey City. It just appeared to be too high in the sky to be a drone, but also, it was effected by the wind either. NOTE: The above image is CGI. 1. Objects in formation would veer off to the left and right, or come up close to each other, almost to the same point and stop/hover – showing fast, precise flying, right-angle turns, or same complex maneuvers mirrored by several objects, or objects moving side-by-side. 3. At one time there were four spheres stacked up one on top of each other and stationary. 4. Lines of stationary spheres would leapfrog one another. One sphere would move up and over a stationary one in front or behind it and fall into line position in front or behind the stationary sphere by exactly the same distance. The next sphere would leapfrog under its neighboring sphere and take up position. These were precise and deliberate, controlled movements. 5. From a flying ‘arrowhead’ formation of five, one banked left, one right, one or two would fly straight-ahead and one fly straight downwards. 6. Two spheres followed each other in tight formation and at very high speed while other spheres were moving in and around these two central objects, travelling even faster and in a more intricate flightpath. 8. One of the stationary dumbbells had a smaller sphere head directly towards it at very high speed as if to collide, then executed a right-angle turn, and swerved to pass right through the dumbbell and came out the other side unchanged — all at high speed! No ‘exhaust’ could be seen when these objects flew in a straight line from A – B. 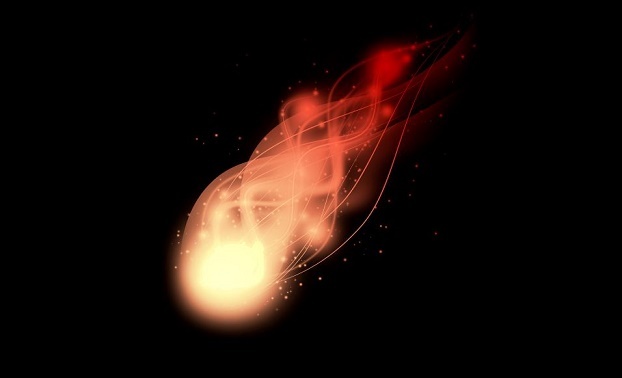 But when objects maneuvering, they could clearly see a light whitish material streaming out from inside (?) the object and behind (this was definitely not a vapour); “it came out of the back of the craft and fell downwards.” The light material appeared to consolidate into long, substantial whitish strands that could be seen falling slowly downwards all around the local area, onto telephone wires and trees. It was not being blown by the wind – there was no wind – there had been several days of heavy rain previously (in other nearby parts of NSW record rainfalls had/were creating flood conditions); Monday was the first clear, clean blue-sky day after this rain. The air temperature was still cool and wintry. The white material appeared to be carried by slight warm-air “thermals”. Very little of this material actually landed in Eunice’s place, but pieces fell in surrounding areas and on the street nearby. Noelene first retrieved a 30-cm strand from a nearby bush – it was extremely light, whitish and strong, like cotton, requiring a good tug to break. It quickly “dissolved” away to nothing when handled. NOTE:The above image is CGI. I am the Chief Investigator for MUFON in New Jersey. I decided to take my grandson Dom the see the Thunderbirds practice in Atlantic City New Jersey. I decided to see the practice session because the main even the next day would be very crowded. I purposely took my camera because I planned to take many photos of the Thunderbirds because I was able to capture UFO craft on my Thunderbirds photos in Cheyenne Wyoming on 5-20-12. 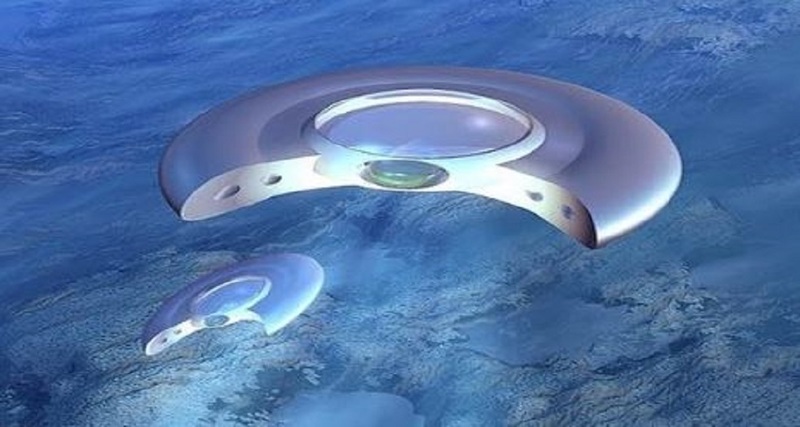 I know these UFO craft like air shows. I did not see the object but after reviewing my many photos off the show, I was able to capture a great photo of a UFO. After enlarging and enhancing the photo, it is something very strange. It is not a bird or bug. The reason I know it is not another air craft is because when the Thunderbirds are practicing, there is restricted air space within a 5 mile radius. This prevents other air show craft from crashing into one another. I also captured a UFO, a few years ago at the McGuire Air Force Base air show. 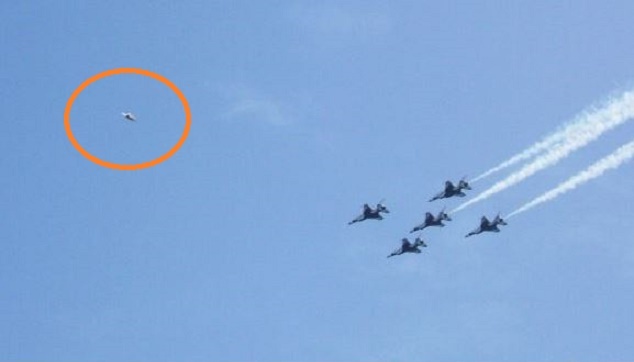 There are many photos out there with UFO’s in the air show photos from all over the world. Google ” air show ufo sightings ”. Many times our cameras can see what our eyes cannot see. Also on todays digital cameras with a screen, its almost impossible to see what on the screen if you are trying to take photos on a sunny day. The screens a too small to make out anything in the background. Next time you attend an air show in your area, make sure you take tons of photos and you may be surprised as to what you will find.